Free admission; public welcome. Pizza, salad, and soda will be served. Sabena Hijacking – My Version is a compelling new film that vividly shows the 1972 hijacking of Sabena Airlines flight 571 from Vienna to Tel Aviv. The docu-drama uses interviews, archive material, and dramatic reenactments to tell the story of the hijacking, the tense negotiations that followed, and the storming of the plane and rescue by a special military unit. Israeli prime minister Benjamin Netanyahu and former prime ministers Ehud Barak and Shimon Peres all played key roles in this historic event and share their reflections on film. Therese Halsa, one of the four hijackers, also gives her version of the events. 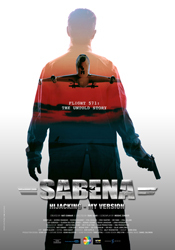 PON’s screening will be the North American university premiere for Sabena Hijacking – My Version. Nati Dinnar is the creator and producer of Sabena Hijacking – My Version, the first docu-drama feature film by DNA productions. Dinnar founded DNA Productions in 2012, and is currently in the process of producing and developing 4 additional movies for the big screen and television. Dinnar builds on 20 years in the creative and competitive Israeli commercial television market. Between 2003 and 2012, he served as Senior VP for strategy, marketing and programming at three of Israel’s top commercial TV stations – Channel 10, Reshet and Keshet Broadcasting (Channel 2). In the prior decade he held various TV related positions such as CEO of the Cable Sports Channel, CEO of Israel’s Nielsen Media Survey Company, a media buyer for the newly formed Channel 2, and an advertising executive with Israel BBDO. Dinnar is Boston-born, and his Israeli life experiences build on his earlier years as a professional basketball player and a military officer in an IDF special unit. He is 47 years old, married to Sagit, and has 3 children – Amit, Roee and Asaf. Together they live in Tel-Aviv. Rozeen Bisharat (29) is a Palestinian Israeli Citizen (1948 Palestinian), filmmaker, performer and activist, and a graduate of the film school at Tel Aviv University. In 2011 Bisharat co-founded “Palestinema”, young Palestinian filmmakers group which advocates for networking, developing and supporting a new wave in the Arab film scene. She has worked in many different award-winning productions with leading directors and producers. She is currently working on her documentary “Terez and I”, produced by Trabelsi productions, which tells the story of Terez Halasah, one of the four hijackers of the Sabena plane.